Pierogi also known as varenyky, are filled dumplings of East European origin.They are made by wrapping pockets of unleavened dough around a savory or sweet filling and cooking them in boiling water. These dumplings are popular in Slavic (Polish, Slovak, Ukrainian), Baltic (Latvian, Lithuanian) and other Eastern European cuisines (such as Romanian) where they are known under local names. Pierogi and varenyky are especially associated with Poland, Ukraine and Slovakia where they are considered National dishes. Pierogi are often semi-circular but triangular and rectangular ones are also found. Typical fillings include potato, sauerkraut and of course cheese, meat and cheese and fruits. 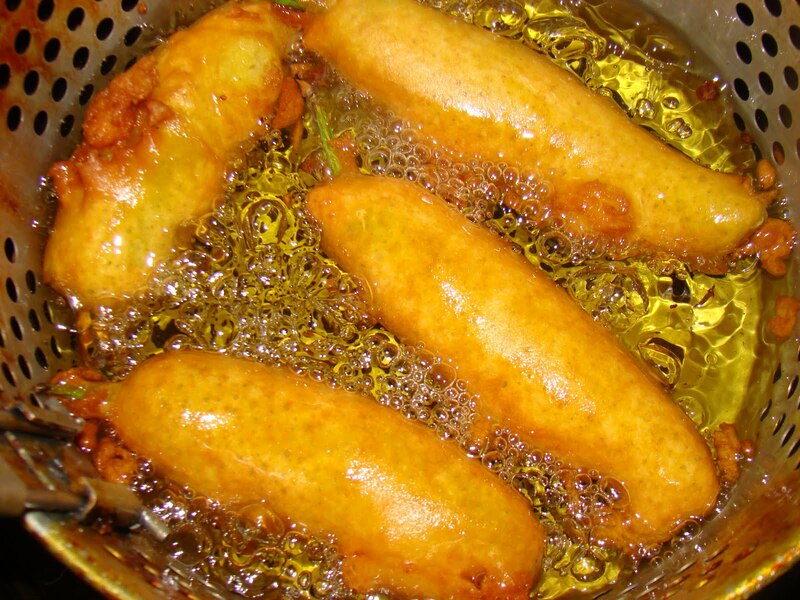 The dumplings may be served with toppings, such as melted butter, sour cream or fried onion. The traditional savory method is with onion, and sweet method with sour cream. I was first introduced to Pierogies when I first saw them in freezer section. In 80s it was a struggle to find vegetarian dishes in grocery stores here unlike today, when lot of people here are vegetarian and vegan. When I saw this dish in freezer section, I bought and made it to my liking. I thought to myself that it was too doughy and with very little filling, then over the years I tried different pierogies and grew a liking to generously filled pierogies that are usually made by ladies in different churches.I don't buy the one from freezer section at grocers anymore. I was always looking for a good recipe and noted that most of the recipes called for eggs in the dough, until I spoke to one of my 20 year old young man (I will call him Mr. D) who just came to this country and used to study Culinary art iin Ukraine. He speaks broken English and food being an international binding language we started talking about Pierogies and he told me that he makes them without eggs and my ears perked up. He gave a verbal recipes (without any measurements like most of the good cooks do). I decided to try it. I had pretty good idea what I wanted in fillings of my Pieorgies. You can play with it and try any fillings that you like. I made potatoes and cheese filling and divided the filling in two parts, to one I added Jalapenos and other just onions and potatoes. Mix all the ingredient for dough together and knead until smooth. Let the dough rest in the bowl covered for 30 min or so, while you prepare the filling. While dough is resting you can start making the filling. Chop onions, (both yellow and green) garlic and Cilantro. Heat oil and butter together in a pan. Add onions and garlic and saute until transparent and light brown. Turn the heat off and add boiled potatoes to fried onions. Mash potatoes with masher and add cheese, salt and cilantro to this mix well. I divided the filling in two parts because I wanted to make half of the Pierogies without Jalapenos and rest with Jalapenos. To one half I added finely chopped Jalapenos. You may separate the dough in two parts and make two large rolls and cut the circles with cookie cutter. I decided to roll them individually, I divided the dough in to 13 golf size balls. Took some flour in a bowl and with rolling pin rolled each ball in to 4" circle. Placed the filling in one half of circle. (I like generous filling, but you may decide how much filling you like and fill accordingly. * Fold the circles in half over the filling and pinch closed by pressing the edges and twisting them with your fingers. * Some people use the pierogies maker press or they use fork to press the edges. Regardless how you close it, make sure the edges are sealed so the filling does not come out in water. * You can make triangle shapes instead of semi circular shapes. * Repeat the process until all all the dough is gone. * I brushed little olive oil on each so they don't dry up or stick to the surface. At this point, when all the pierogies are filled you can freeze them or cook them. To cook while you are filling the pierogies you can heat and boil water in a pan. When water starts boiling you can drop the pierogies one by one in water. I cooked 6 at a time. Cook them for few min on medium heat until they float. Take then out of water with a strainer and set aside. 2 tables spoon and drizzle of butter to fry pieorgies. In all wok or pan heat oil with butter. When butter is melted, add sliced onion, peppers and Mushroom. Heat oil and butter in a shallow griddle like pan. Lay pierogies on heated oil and cook each side until light brown on both side. Toss the brown pierogies in the sauteed onions, mushrooms and pepper mix. Or you may plate the pierogies and top the sauteed onions, mushrooms and pepper mix. Top them with shredded cheddar cheese and you may melt the cheese by placing the place in Microwave. You may serve them with side of sour cream. You can be creative and use any topping or desired sauce, but I just like it with buttered veggies. This recipe yields 12-13 pierogies, I made them large, but you may make them small and may get 16 or so pierogies. Recipe adapted by Surekha from a recipe given to her by Mr. D. and Photographs by Surekha.